1804 This flavorful tea starts with fruity notes and ends with a bright floral finish. Cozy Chamomile A mellow, calming tea with hints of cinnamon, apple and lime. Eve’s Blend A light, floral teas designed especially for women. Adam’s Blend A manly tea that delivers an earthy finish with notes of sandalwood. Ginger! ... MaryAnn! An exotic, tropical flavor that brews well as both hot and iced teas. Bay Flower Fresh green tea tied into perfect spheres... unfolds to reveal a beautiful flower. Get Up and Go! Built from herbs used to increase stamina, this blend works to neutralize the effects of free radicals and oxygenate the blood. Slim and Tone Blended to rev up the metabolism with a delicious, invigorating balance of herbs and botanicals. Free Your Mind! A dynamic, yet calming, elixir of green tea and botanicals. “Awesome” Chai Our fusion of Assam Tea with Cardamom, Cinnamon, Ginger and Cloves. 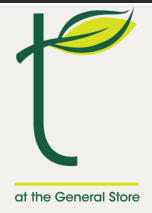 Today and Always Comprised of our most exquisite teas and botanicals... floral, sweet and smooth. Feel Better! Soothing herbs with a hint of spice. Chill Out! Balanced Citrus with a hint of Peppermint. Where There’s Smoke, There’s Fire! This Lapshang Souchang is smoked over pine needles for a distinctive aroma and full flavor. Summer Passion With a dry, balanced finish and a slightly sweet taste, this tea is also great iced. Our teas are presented to you as loose teas, which are steeped in clear glass pots. This ensures the clarity of flavors will brew properly in your tea. In our tea bar, we offer all of the teas on this menu, in addition to a variety of tea accessories. Be sure to visit us, stay awhile and enjoy a cup of... Enjoy our teas no matter where you live! 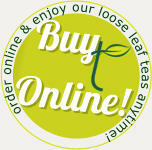 We are proud to offer our exclusive loose leaf tea blends for sale at our online store thealthandenergy.com and they can be delivered right to your door! 1804 This flavorful tea starts with fruity notes and ends with a bright floral finish. Cozy Chamomile A mellow, calming tea with hints of cinnamon, apple and lime. Eve’s Blend A light, floral teas designed especially for women. Adam’s Blend A manly tea that delivers an earthy finish with notes of sandalwood. Ginger! ... MaryAnn! An exotic, tropical flavor that brews well as both hot and iced teas. Bay Flower Fresh green tea tied into perfect spheres... unfolds to reveal a beautiful flower. Get Up and Go! Built from herbs used to increase stamina, this blend works to neutralize the effects of free radicals and oxygenate the blood. Slim and Tone Blended to rev up the metabolism with a delicious, invigorating balance of herbs and botanicals. Free Your Mind! A dynamic, yet calming, elixir of green tea and botanicals. “Awesome” Chai Our fusion of Assam Tea with Cardamom, Cinnamon, Ginger and Cloves. Today and Always Comprised of our most exquisite teas and botanicals... floral, sweet and smooth. Feel Better! Soothing herbs with a hint of spice. Chill Out! Balanced Citrus with a hint of Peppermint. Where There’s Smoke, There’s Fire! This Lapshang Souchang is smoked over pine needles for a distinctive aroma and full flavor. Summer Passion With a dry, balanced finish and a slightly sweet taste, this tea is also great iced. Our teas are presented to you as loose teas, which are steeped in clear glass pots. This ensures the clarity of flavors will brew properly in your tea. In our tea bar, we offer all of the teas on this menu, in addition to a variety of tea accessories. Be sure to visit us, stay awhile and enjoy a cup of... Enjoy our teas no matter where you live! 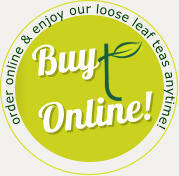 We are proud to offer our exclusive loose leaf tea blends for sale at our online store thealthandenergy.com and they can be delivered right to your door! If you are looking for gift ideas, come visit us! 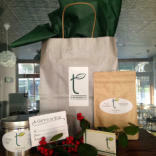 In addition to gift cards, we offer all of our loose leaf teas, accessories such as steepers, tea sets and much more!